is an opportunity for all YouthBuild Columbus Community School students. 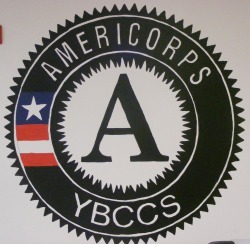 Students' participation in AmeriCorps is voluntarily however highly encouraged by faculty and staff. During the school year students earn 450 hours through regular school attendance and other community projects. In the past community service projects have included working with church congregations in the creation of a community vegetable garden, performing a young children puppet show, and even hosting a dinner for Somali residents of Columbus. Upon completing the required hours students will receive an education award. Students will have seven years to utilize their ed awards toward post-secondary education including many trade schools or other alternative programs.